I collected this figure in the same way as the preceding figure. There are two examples of this pattern in the Philadelphia Free Museum of Science and Art, collected by Mr. Stewart Culin; No. 22715 is a Navaho figure, from St. Michael's Mission, Arizona, called Sono-tsihu = Twin Stars; No. 22606 is from Zuñi, N. M., called Pi-cho-wai, wai-lo-lo = Lightning; it has been artificially distorted. 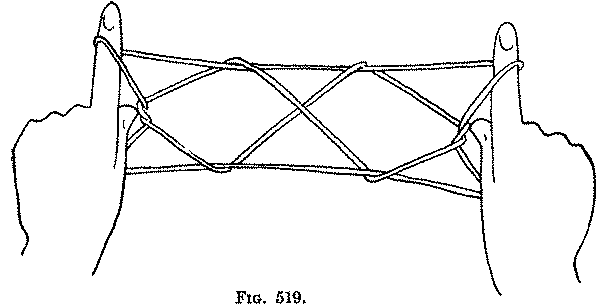 Second: Transfer the index loops to the thumbs, by putting each thumb from below into the index loop returning the thumb to its position, and withdrawing the index (Fig 516). Keep the two loops on the thumb well separated; the loop taken from the index up at the tip. Third: Bend each index toward you and down through the upper thumb loop, and then down to the far side of the lower far thumb string; take up on the back of the finger this lower far string (Fig. 517, Left hand), and lift it up on the tip of the finger as you straighten the latter to its position (Fig. 517, Right hand). Fourth: Pass each middle and ring finger from below (that is, toward you) through the lower thumb loop, and catch between these fingers the upper near thumb string (Fig. 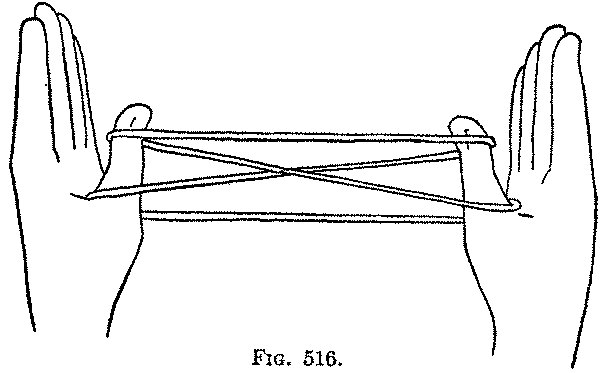 518), and draw it away from you through the lower thumb loop; then, hooking the middle finger over the string, release the loops from the thumbs, and turn the palms away from you (Fig. 519). The figure becomes extended between the index fingers and the middle fingers closed on the palms. There is not much to this figure. The final pattern is almost exactly like the "Two Diamonds" of the Osage Indians, if that figure be formed with a single string loop. The Fourth movement is a characteristic Navaho method, which, as we shall see, forms the most important part of the "Storm Clouds."